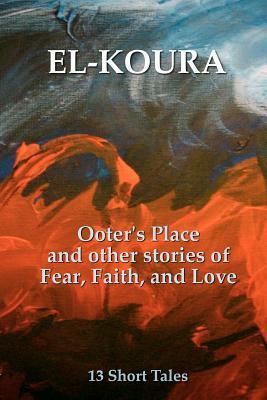 "Ooter's Place and Other Stories of Fear, Faith, and Love" is a collection of short stories written by Karl El-Koura that were written over a 12 year period. Whilst the title itself maybe a little bit of a mouthful, the stories themselves are all well paced, entertaining and incredibly varied. The collection really does cover a large range of genres, although the majority are speculative fiction such as Horror, Science Fiction and Fantasy. I have to admit that as I had never heard of the author prior to reading this collection and due to it being self-published I was expecting to find a fair few turkeys alongside any gems in this collection. In hindsight, this was a rather blinkered view to take as what I found was an enjoyable range of well written and engaging short stories. Every single one of them had me thoroughly entertained no matter the genre or subject. The collection itself is split into three sections under the headings of Fear, Faith and Love with four stories appearing in each. To be honest, I found the placement of the stories rather arbitrary and I think many of the stories could easily have fit into either section. However, El-Koura himself does actually realise this himself and freely admits it in his introduction. One element I really appreciated with this collection was the forewords written by El-Koura prior to every story. It gave a decent basis for the story itself and helped to ensure that the reader had some understanding about what the story was conveying. The first section in the collection which covers stories about fear is probably the most self explanatory portion of the collection. The stories here range from an incredibly short and quirky piece entitled "Tom's Refrigerator" about a man's rather controlling computerised fridge to an engrossing story called "How You Die" that takes a look at how the imagination of two young brothers telling ghost stories can lead to a rather dangerous outcome. The second section covering stories about faith was the one I wasn't looking forward to as I had visions of stories written around religious preaching etc. However, I was happy to see that there was no hidden intent behind these stories. In fact, whilst some of them did have elements on religion within them, some of them didn't and the stories were mainly focussed on faith as a concept and how it shapes our lives. These stories ranged from an enjoyable, poignant and slightly amusing look at a man who comes to believe he is a superhero that is entitled "The Man Who Mistook Himself for a Superhero" to a rather engaging journey of a man whose sub-conscious seems to give him one last adventure before his life ends in the story "Blink". The final section includes stories about love and I was quite impressed to see that El-Koura didn't just take the easy route of concentrating only on romantic love. They also covered platonic love such as that between two friends as shown in the rather surreal alien invasion story "They Came From Ooter’s Place". These stories about love didn't just stop there however as the final story in the section entitled "The Curious Case of the Book Baron" follows the mysterious case of someone breaking into homes and leaving books and is based around the love of reading. I suspect, most people who read this collection will read that story with a big smile on my face as I did. Overall, I found this to be a thoroughly entertaining and enjoyable collection of stories, with some of them reaching me on an emotional level. I can't recommend this collection highly enough, especially if you are a fan of engaging speculative fiction in the short form. If you aren't sure then head along to smashwords and read the free sampler that includes three stories from the collection.